Perfect for a couple! The Serenity Casita includes living area, one bedroom, kitchenette, & private bath. Set in a lush quiet garden, the Serenity Casita offers peace, privacy and relaxation. Accommodations perfectly located in a lush garden setting within walking distance to the Malecón (bay boardwalk), shops, marinas, restaurants, downtown and other points of interest. La Paz rentals offers a unique and peaceful alternative to the common tourist getaway. Our guests are treated to the best sunsets Mexico has to offer! This was the second time my wife and I have stayed in Michael's perfect casita and it was just as we remembered it. It is cozy and has everything we needed for our three day stay in La Paz. What we enjoyed the most is the comfort of the inner courtyard, the secure and locked parking for our car and Michael's friendliness. And we enjoyed seeing Michael's dog Buddy again. If we get to La Paz in the future, we will certainly book this casita again. Great little place with 'expansion room' into the lovely courtyard. Owner Michael was extremely helpful with any questions or needs. We particularly liked how near we were to the Malecon and the marinas (our son and daughter-in-law sailed in, and we came to share time with them). Everyone in La Paz was friendly, we found plenty fun things to do, and there are lots of great restaurants. This casita has everything you need to stay while you explore La Paz. It is only 1/2 mile from the Malecon and the harbor and there are several very good restaurants even closer. 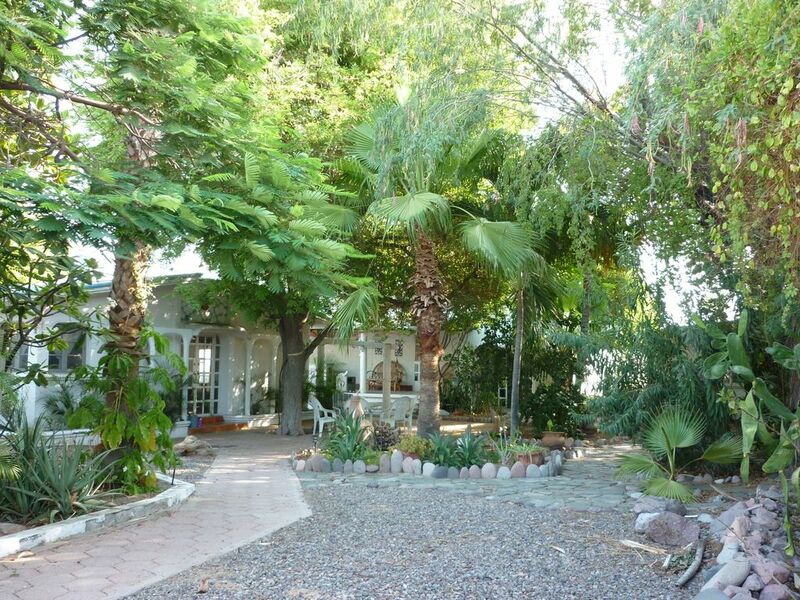 The casita is situated in a wonderful courtyard with many interesting plants. Michael, the landlord, is helpful and attentive and his dog Buddy is very friendly. We especially appreciated the secure, off-street parking for our rental car, though we felt safe in Michael's neighborhood. We were very comfortable in la casita. Michael was a fantastic host, providing everything we needed yet still provided personal space. We also enjoyed Buddy's company. Would re-book and recommend to friends. Lovely private courtyard, great host, comfy casita. Michael was wonderfully helpful. We arrived late from the airport with no pesos and no dinner. He reached into his wallet and loaned us 1000 pesos and recommended a great taco shop just one block away, which was excellent. The next day we pointed out some maintenance needs of the casita (leaky sink and clogged shower head); he immediate went to work to repair the problems apologizing profusely. The kitchen is exactly as shown, very minimal, but well supplied. His dog, Buddy, a very sweet pit bull, was very friendly, always happy to see us and even sleeping by our door waiting for us to wake up in the morning. But the main attraction here is the private courtyard garden, such a cool, quiet, peaceful place to return to and relax. Great hosts, pleasant surroundings and a clean, comfortable casita! Just right. Michael and Buddy are the best. The property is an oasis in a mostly locals neighborhood. You will get great exposure to the Mexican lifestyle: church bells, musica, pleasant greetings, local food and upscale restaurants within walking distance. Michael is very helpful, yet respectful of your privacy. Great sea tours and experiences await.